To see the settings that are currently selected for the Musicnotes Sheet Music Player app, tap on the Settings section in the bottom of the left slide-out menu. If you are not signed in to the app, the Guest Account will be listed at the top of the Settings section and a "Sign In" button will be available. If you are signed in, your Name, User Name and Email will be listed at the top of the Settings section and a "Sign Out" button will be available. Tapping this button will sign you out and bring you to the Guest song list. Type the email address or username associated with your Musicnotes.com account into the "Username or Email" field, type your password, and tap "Sign In" to sign in to you account and access your purchased music. When you import a new song to the app, by default only your purchased key is sent to your device. You may change this by selecting the "Import All Transpositions" option in the Settings section. The next time you import, all available transpositions of each of your pieces will be downloaded. Please note: Enabling this setting will increase the time to import your music. Even with this setting off, you can download individual transpositions from inside the sheet music itself. (Please see the Transpose Your Sheet Music topic for more information). 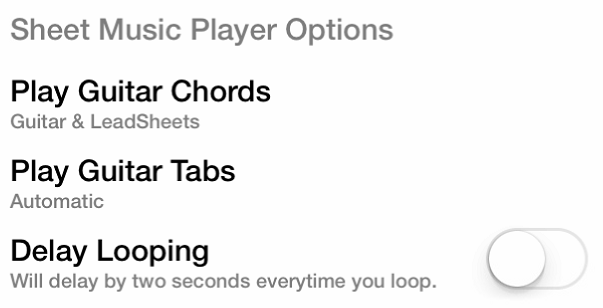 There are three settings within the Musicnotes Sheet Music Player app that affect the default playback behavior. The "Play Guitar Chords" option allows you to choose which pieces will include the notated Guitar Chords during playback. The default is for only those pieces with a guitar part to play chords. If you set this to "None", the chords will also not appear in the Audio Mixer within the sheet music Viewer. The "Play Guitar Tabs" option affects Guitar TAB pieces only, and allows you to choose whether the audio will be generated from the notation staff or from the TAB notation during playback. It is recommended that you leave this at "Automatic", since the audio for many pieces is optimized for only one mode. The "Delay Looping" option allows you to toggle between continuous looped playback of your selection, or to insert a delay at the start of your selection in the looped playback. Once you are signed in to the app with your Musicnotes account, you will be able to connect your Dropbox account in order to Import Your Personal Sheet Music (PDFs). Tap the "+" plus sign button, and you will be prompted to sign in by entering the email address and password associated with your Dropbox account, and approve the connection to the Musicnotes app. After adding an active Dropbox connection, the "+" plus sign button will change to display an "X" button. Tapping the "X" button will prompt you log out of your Dropbox account, and the app will remove the connection. If you have signed in to link your Dropbox account while in a Guest Account, then attempt to sign in to the app with your Musicnotes account, you will be logged out of your Dropbox account, and the connection will be removed from the app. You will then need to sign back in to Dropbox to reconnect with the app. If you are signed in to the app with your Musicnotes account and previously linked your Dropbox account, then change user to a separate Musicnotes account, you will be logged out of your Dropbox account, and the connection will be removed from the app. You will then need to sign back in to Dropbox to reconnect with the app.